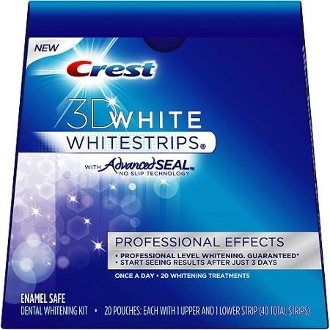 Offering results as effective as professional teeth whitening treatments, Professional Effects Whitestrips are designed to remove over 14 years of stains so you can start seeing results in just 3 days. The enamel-safe ingredients remove stains beneath the enamel surface where most whitening toothpastes dont. Wear 30 minutes daily for 20 days to get professional-level whitening in the convenience of your own home.